Linda Tirado's new book busting myths about American poverty. When Linda Tirado responded to an online forum question: "Why do poor people do things that seem so self destructive?" she had no idea her response would go viral. Her essay, Why I Make Terrible Decisions, or poverty thoughts sparked national conversation and backlash. At the time, Tirado was a young mother of two, working two part-time jobs. She had recently returned to college. The essay detailed what her life was like, and how she and her family had reacted to the pressures of being poor. Rest is a luxury for the rich. I get up at 6AM, go to school (I have a full courseload, but I only have to go to two in-person classes) then work, then I get the kids, then I pick up my husband, then I have half an hour to change and go to Job 2. I get home from that at around 1230AM, then I have the rest of my classes and work to tend to. I'm in bed by 3. This isn't every day, I have two days off a week from each of my obligations. I use that time to clean the house and soothe Mr. Martini and see the kids for longer than an hour and catch up on schoolwork. Those nights I'm in bed by midnight, but if I go to bed too early I won't be able to stay up the other nights because I'll f*** my pattern up, and I drive an hour home from Job 2 so I can't afford to be sleepy. I never get a day off from work unless I am fairly sick. It doesn't leave you much room to think about what you are doing, only to attend to the next thing and the next. Planning isn't in the mix. This essay later inspired a book challenging preconceptions about the lives of the millions of Americans living below the poverty level. 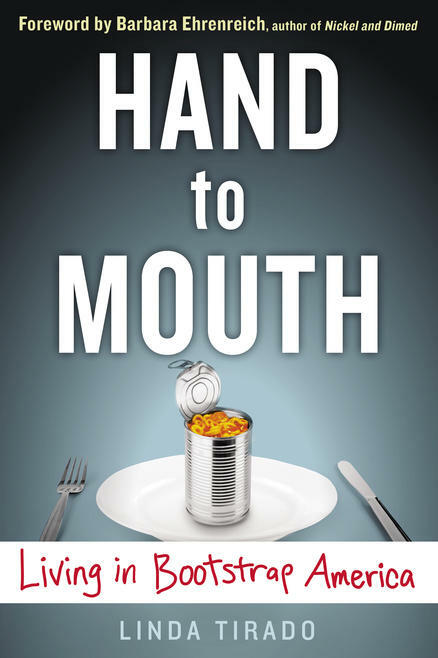 Host Frank Stasio talks to Linda Tirado about her book Hand to Mouth: Living in Bootstrap America (G.P. Putnam Sons/2014). She speaks tonight at The Regulator Bookshop in Durham at 7 p.m.